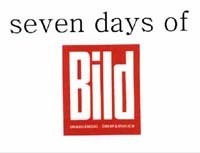 Inspired by David Dellafiora's call for a 'field study emanation', Böhm starts Seven days of Bild in February 2001 by buying the German tabloid 'Bild' (picture, image) for a week. Böhm documents this week in a pseudo-scientific way. 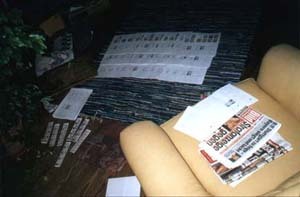 Each day passport photos are taken, thoughts concerning the project are written down. Later different phases of progress are photographed. 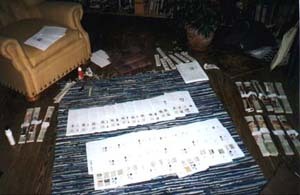 Beside copies of the passport photos each of the resulting 100 copies contains eight pages with pieces of each page of each edition of Bild, cut out at the same position. Each copy is unique. 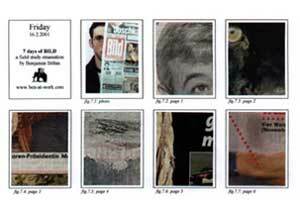 There is a special edition containing 32 copies plus a certificate with an original passport photo and one documentation photo sent in a specially designed envelope. One copy of the special edition was exhibited at the Stadtuseum Tübingen. 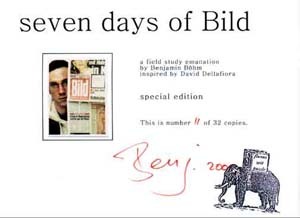 Seven days of Bild was also part of Dellafiora's Field Report 2002.